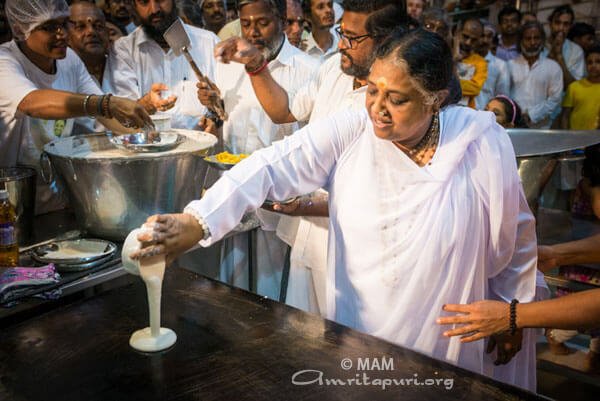 As has become a regular tradition, before leaving for a foreign tour, Amma takes time out to make and serve Masala Dosa for the residents of Amritapuri Ashram. 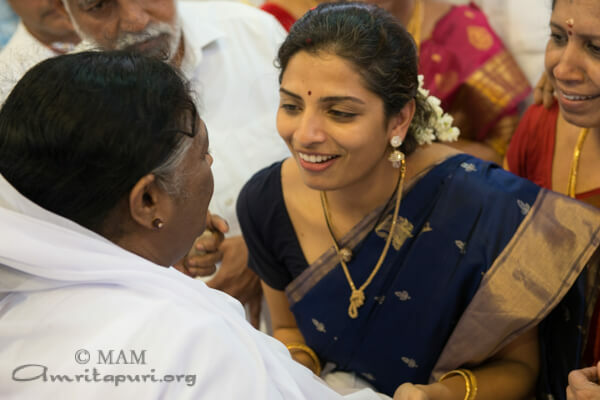 Its a precious moment for all. 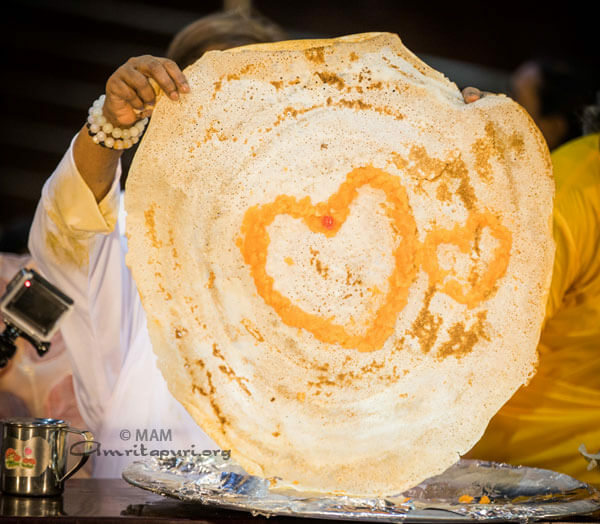 Today also before her Japan – USA – Canada yatra, after the evening bhajans Amma made Masala Dosa and sevrved all. 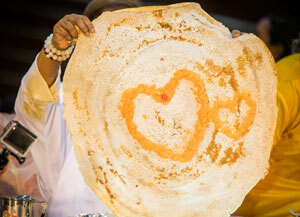 Thousands of Masala Dosas’ preparation and serving took place in less than an hour. 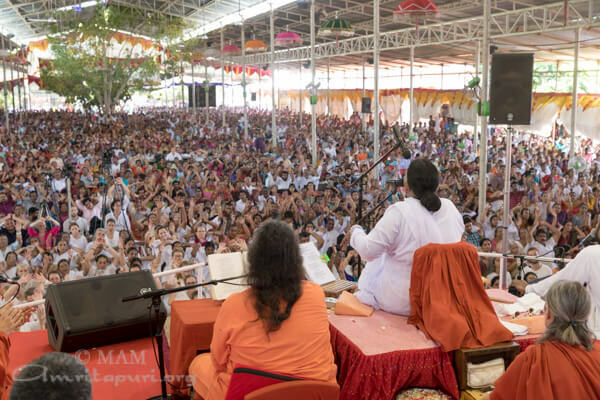 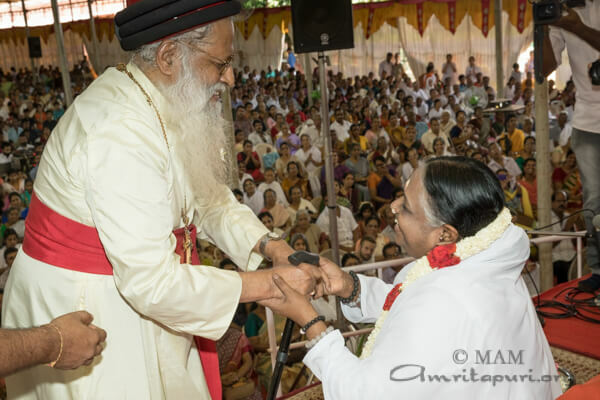 For the last few days Amma has been privately meeting all the ashram residents one by one, clearing their doubts, guiding them on the right path, inspiring to be more selfless through simple words, small anecdotes and with examples from her life. 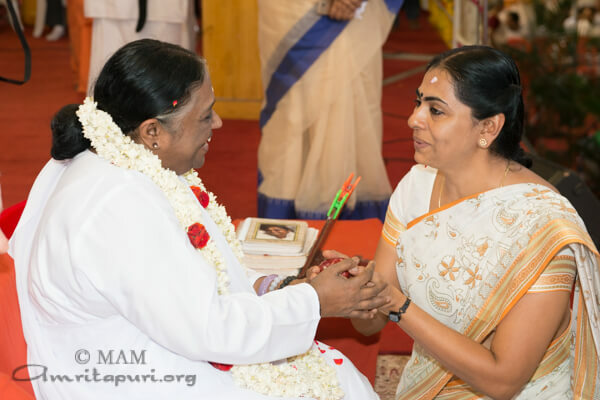 In order to explain the point Amma narrated an anecdote. 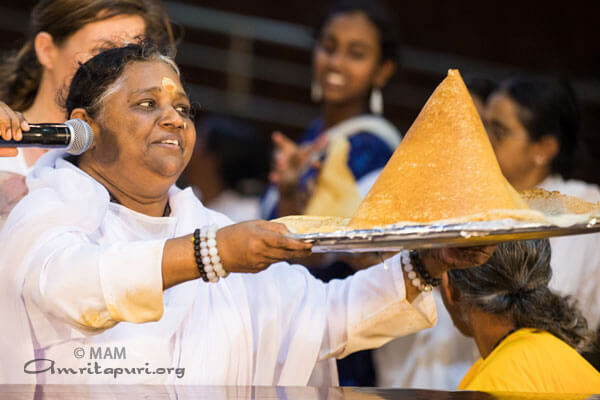 “Perhaps, when you were going through school, a friend of yours needed money for books, food, clothing, and the like. 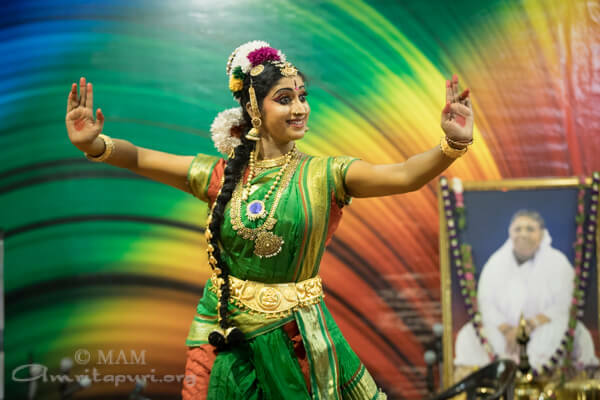 Many years later you run into some financial difficulty. 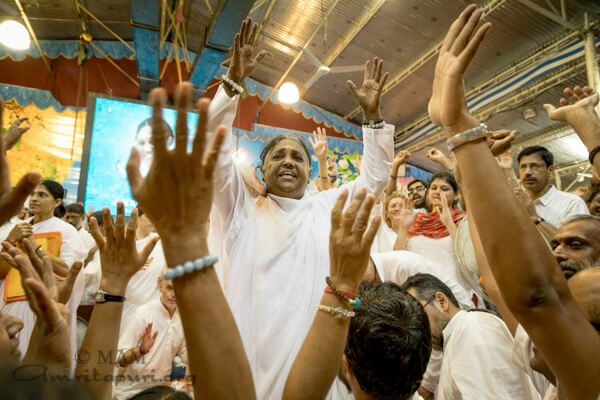 Your friend, the one who you helped in school, is now rich and has a good job. 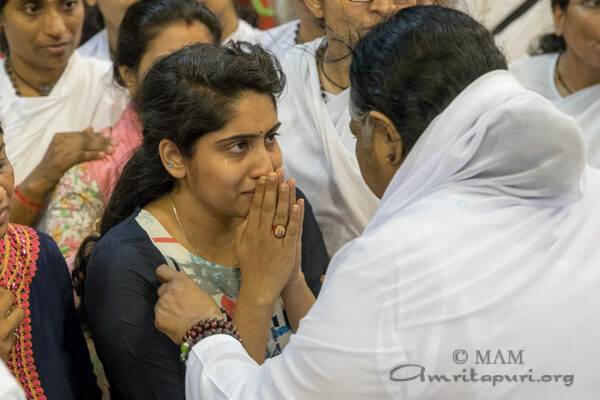 You may think to go to him for help, remembering that you had helped him and thinking that he will certainly repay the favour now, but, when you meet with him, you find out that he is not willing to help you. 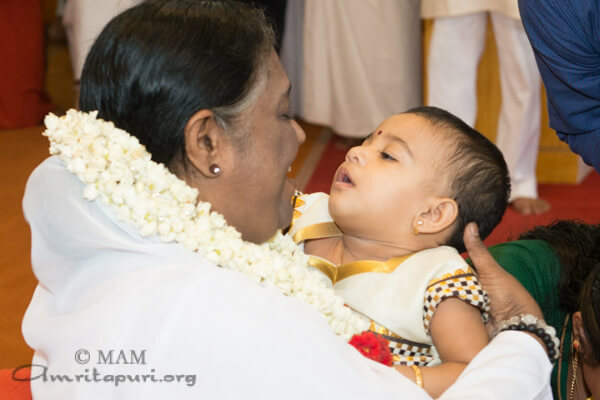 Amma then began to expand on this thought. 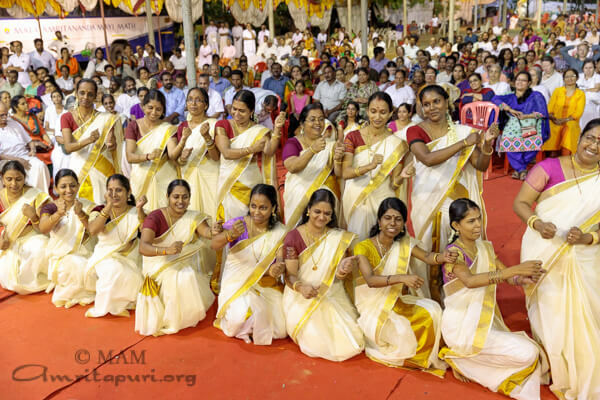 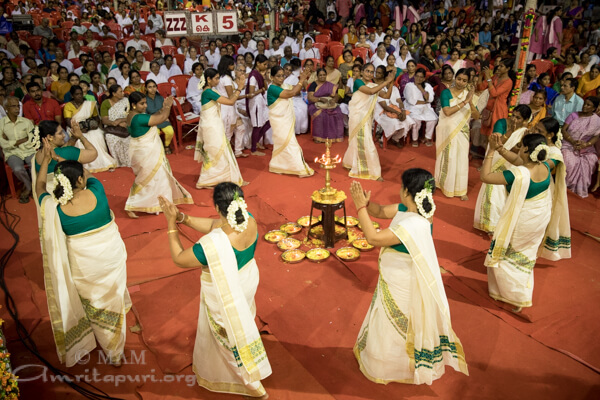 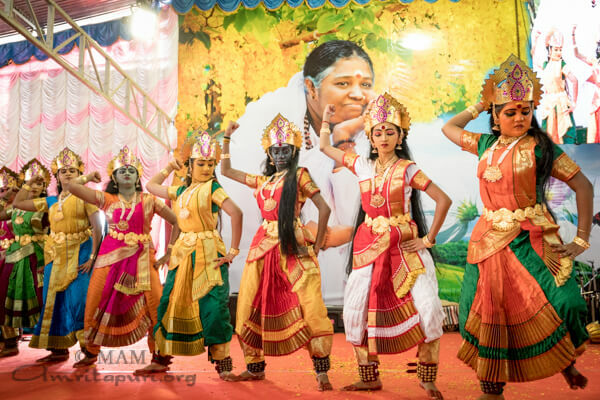 After Kochi, Amma held a two days brahmastahanm festival in Trissur. 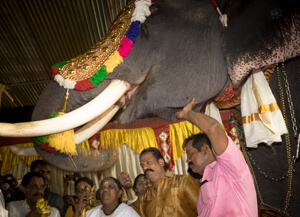 Amma was welcomed with PanchariMelam and Raman, the elephant was there. 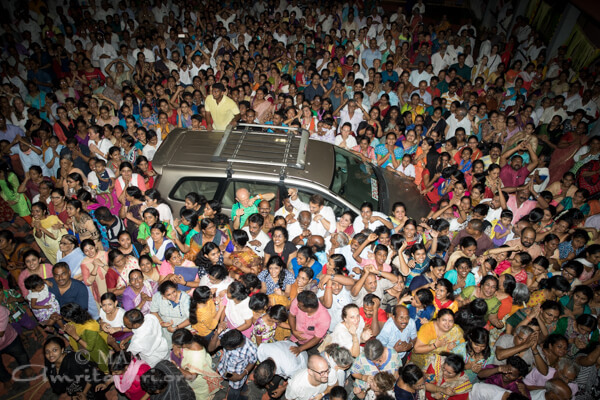 The heat and the weather did not reduce the number of people coming to meet Amma. 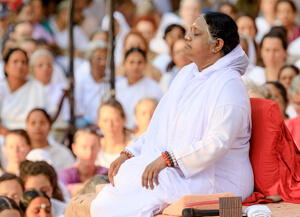 She lead everyone in bhajan and meditaton, gave talks on both days. 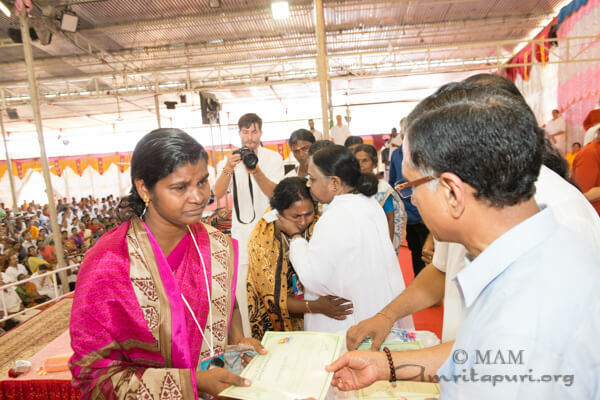 Amma also distributed saris to the members of local women’s self help groups, handed over certificate of completion of newly constructed 15 toilets in that area. 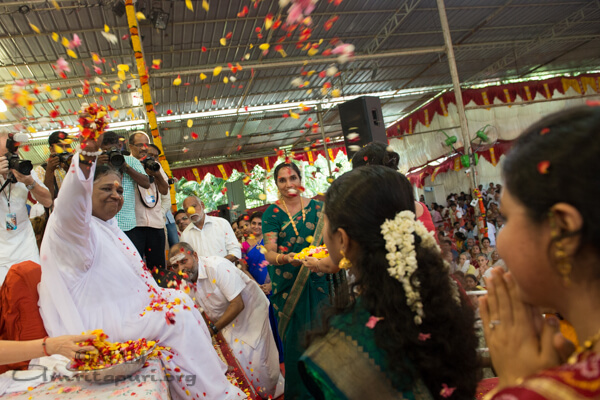 The toilet construction is part of Amma’s efforts to make the state open defecation free. 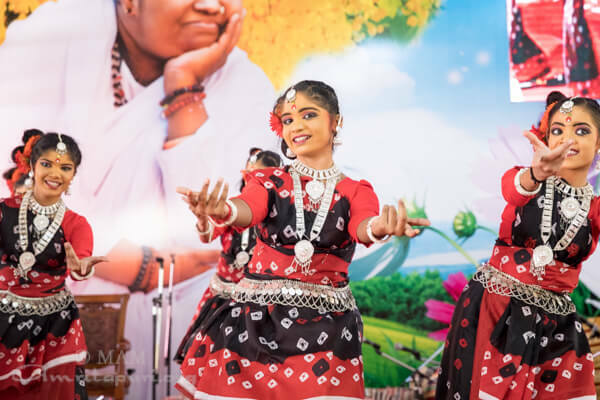 The local Amrita Vidyalayam children presented different cultural programs to add festive flavour to the program. 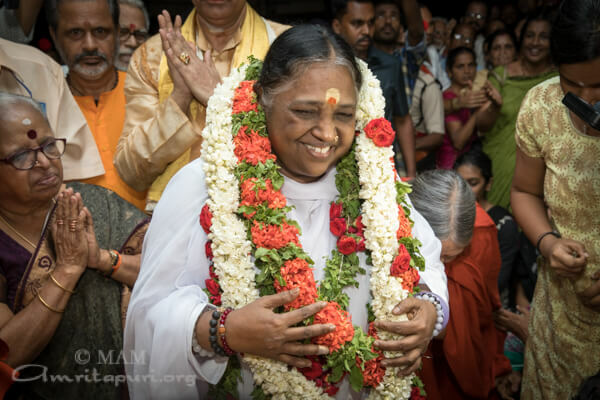 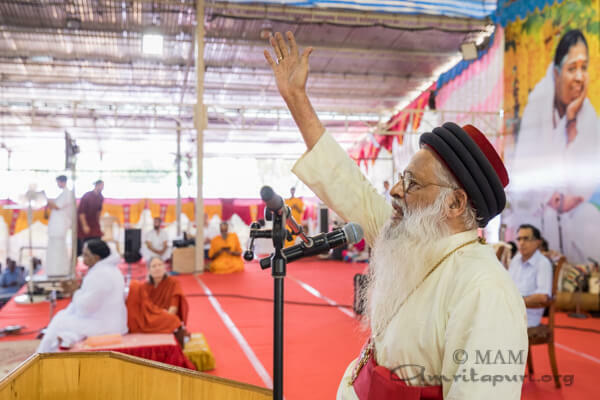 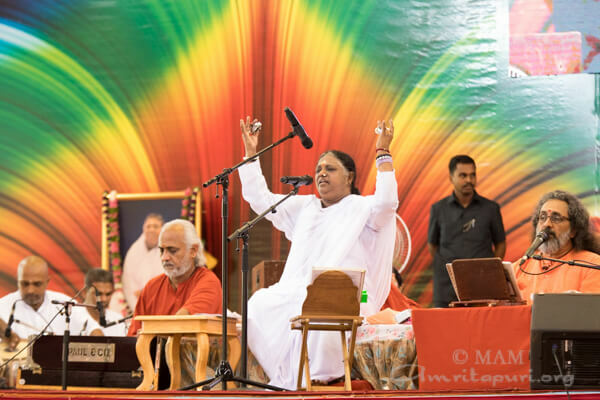 At the end of the last darshan Amma sang “Guruvadi Vani Sunlo…” to conclude Bharata Yatra 2017 and return to Amritapuri. 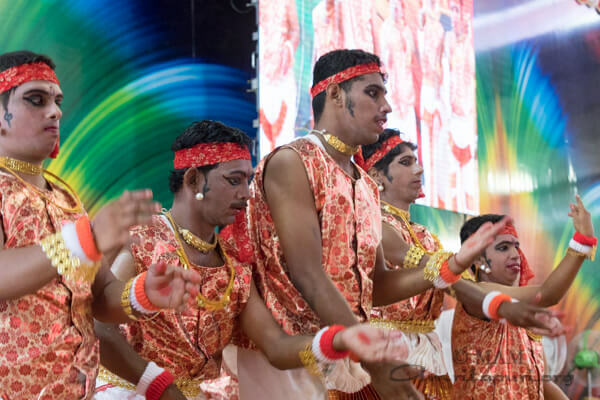 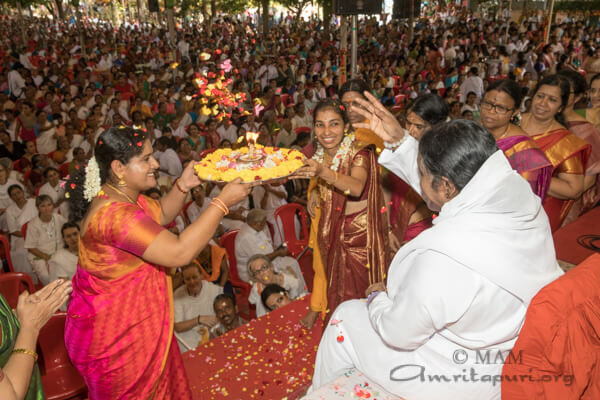 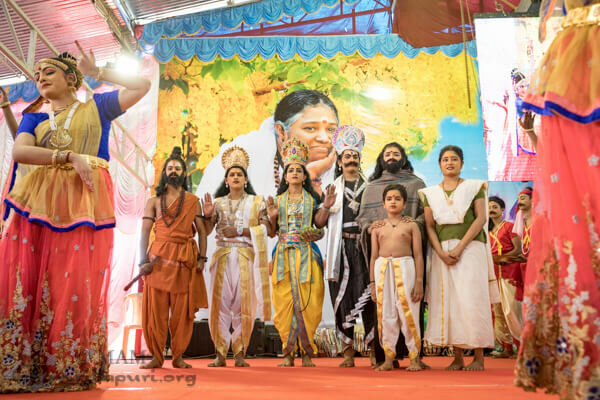 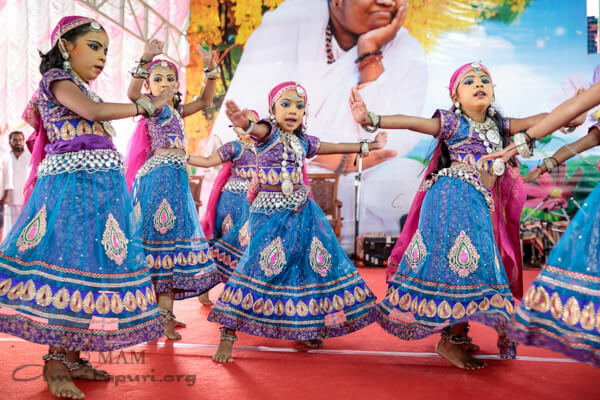 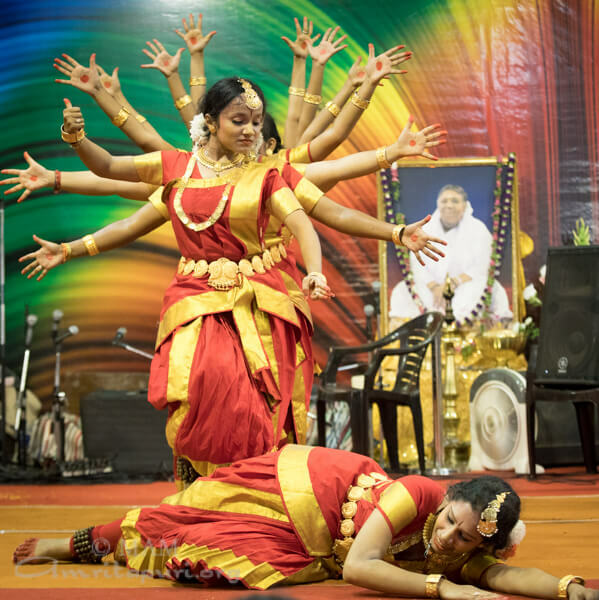 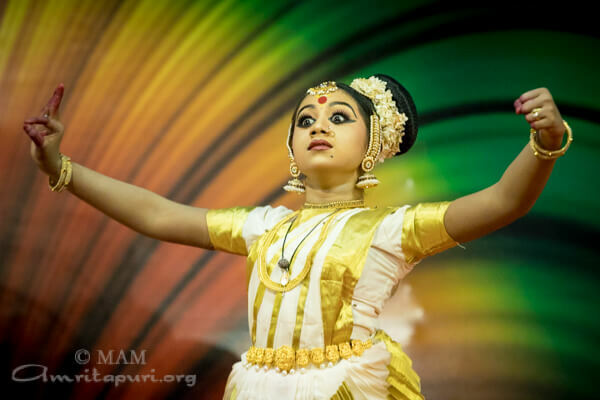 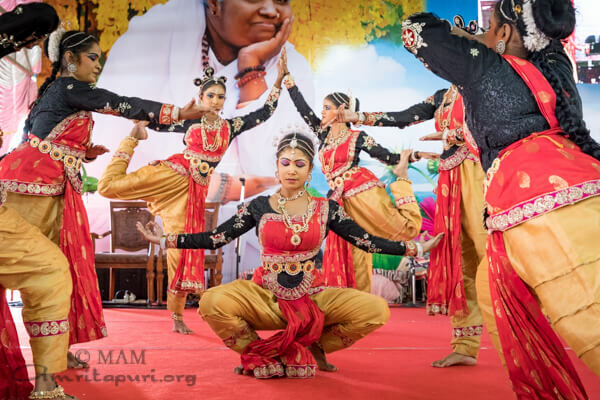 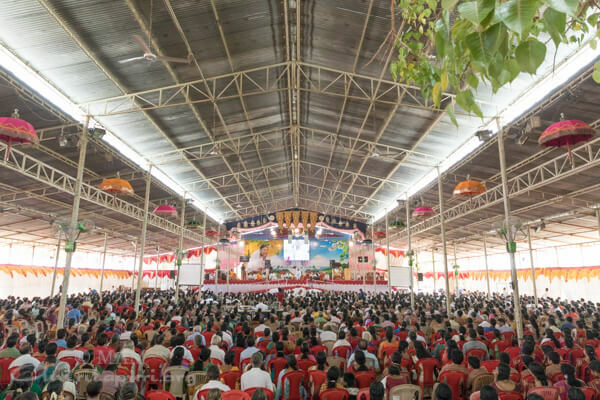 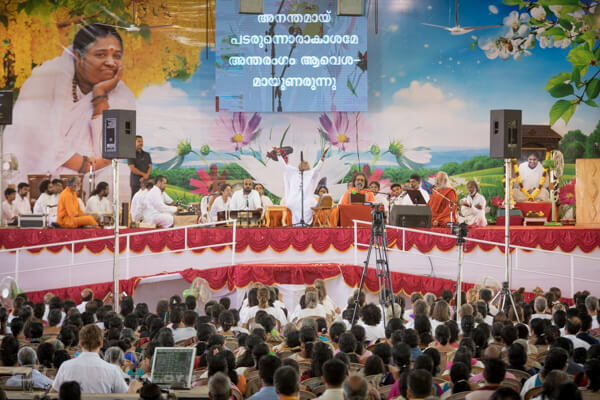 After spending most of April touring Malaysia, Singapore and Australia, Amma returned to India and held a two days Brahmasthanam festival in Kochi, Kerala. 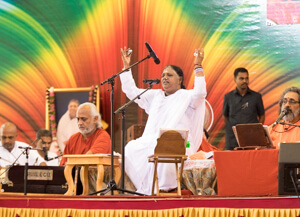 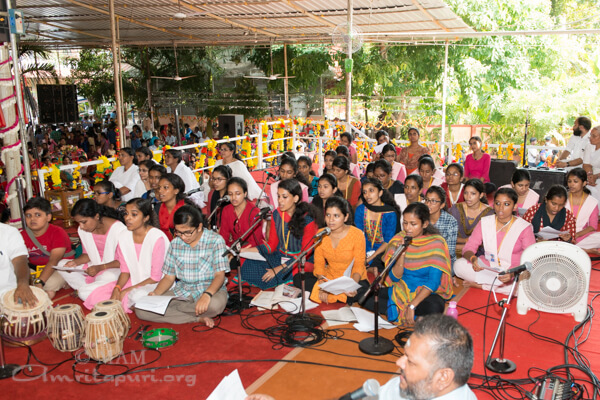 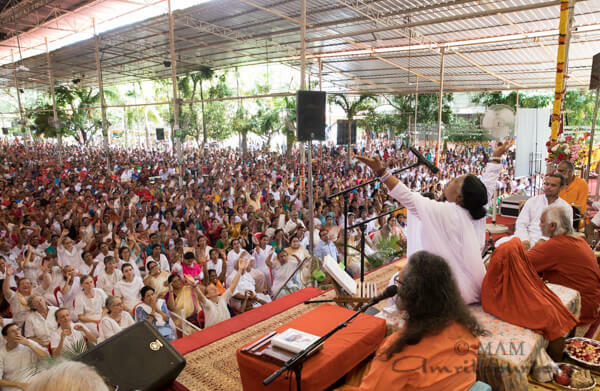 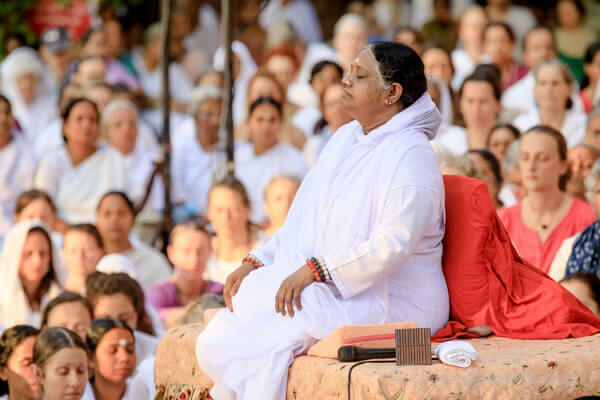 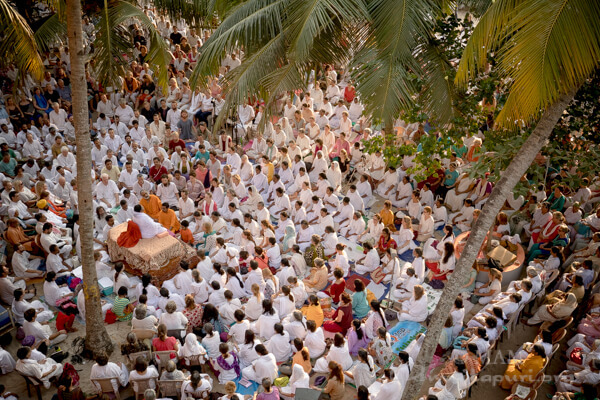 Each day, Amma lead everyone in meditation, bhajans and gave satsang. 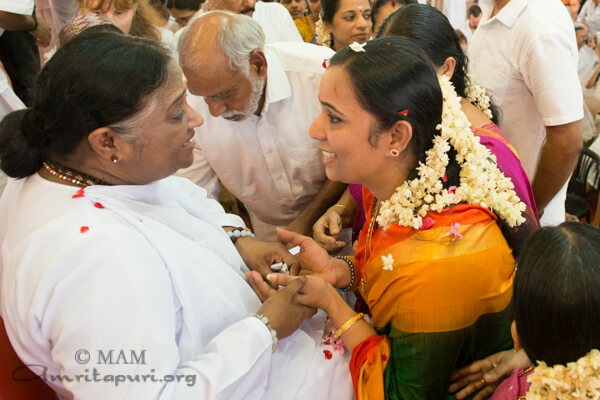 Despite the scorching heat, all the devotees patiently waited hours for Amma’s darshan. 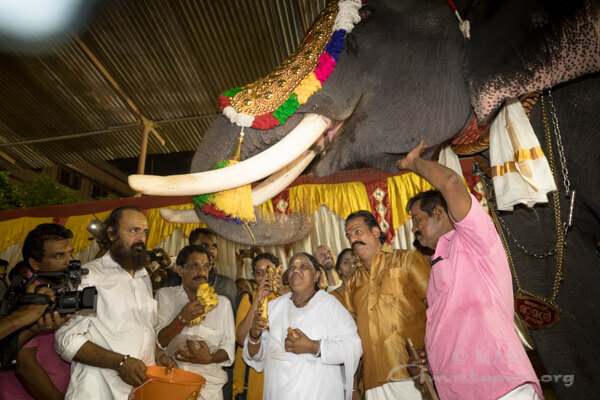 Amma was welcomed to Kochi with Purnakumbham by the priest of the Guruvayoor temple. 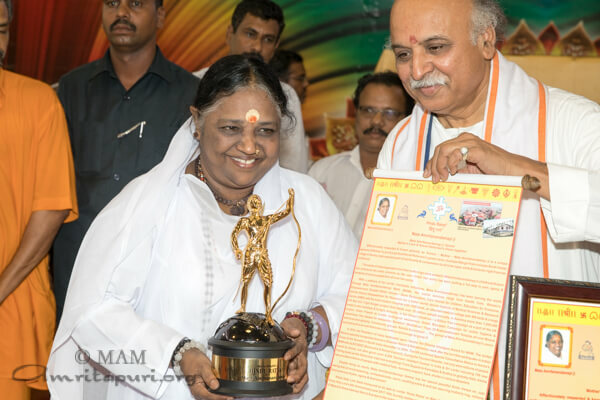 During the programs, the Working President of the Vishva Hindu Parishad, Pravin Togadia presented Amma with the ‘Hindu Ratna Award’ , saying the award was a tribute to the ‘Mother of the World’. 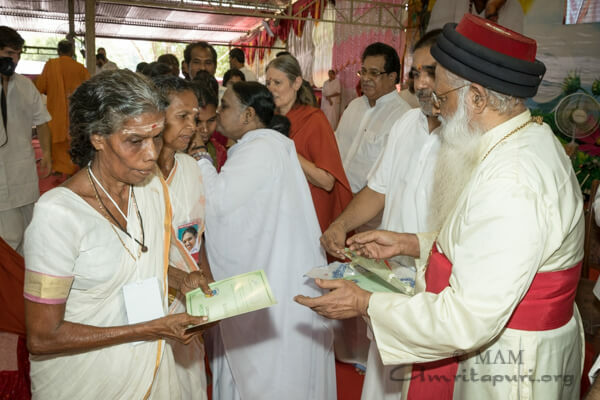 Saumini Jain, the Mayor of Kochi and the Asha Sanal, the Panchayat President were also among the officials who came to meet Amma. 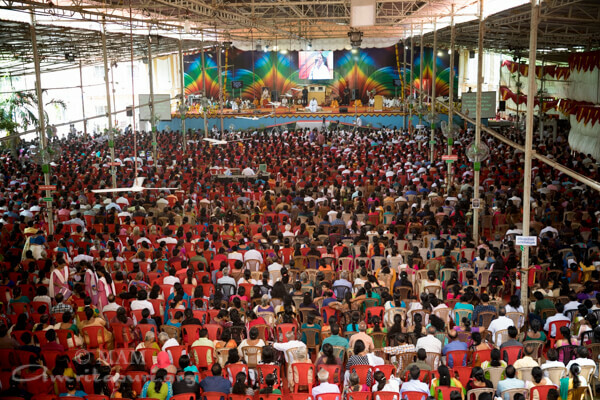 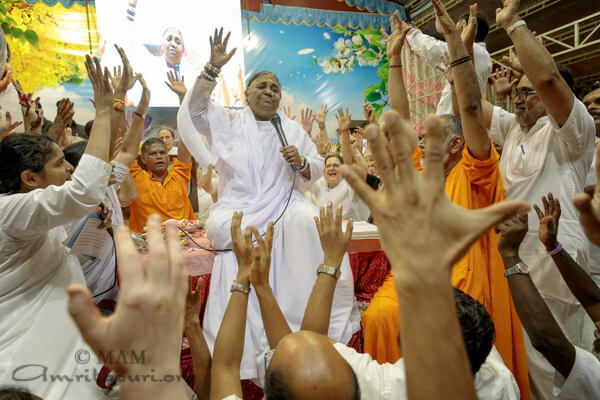 Addressing the devotees Amma said: “Mindless speaking triggers most of the problems in the society these days. 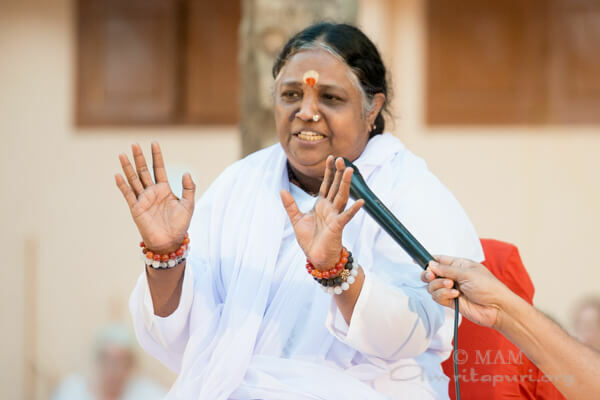 Like when water moves beyond its limits, it can harm people, even words have limits. 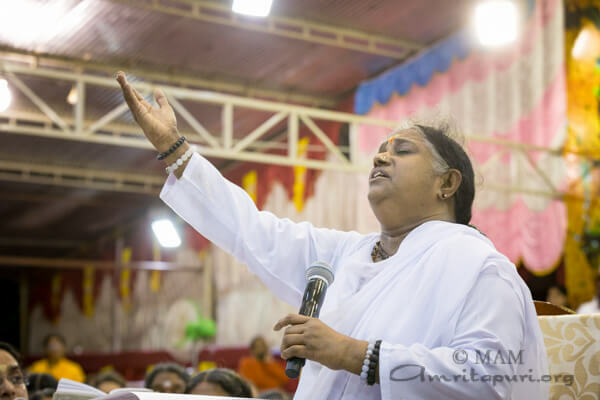 When we cross those limits, they can cause widespread destruction. 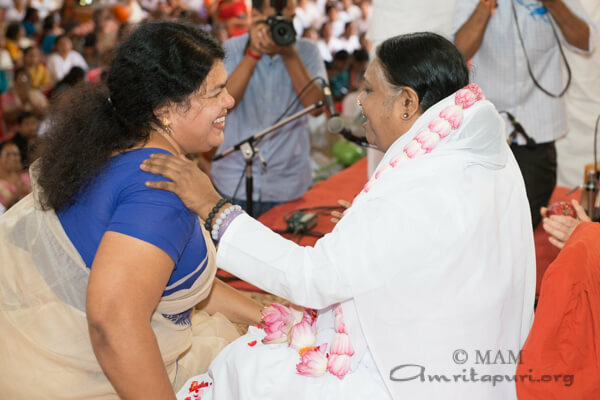 We should celebrate our life with kind words and good action”. 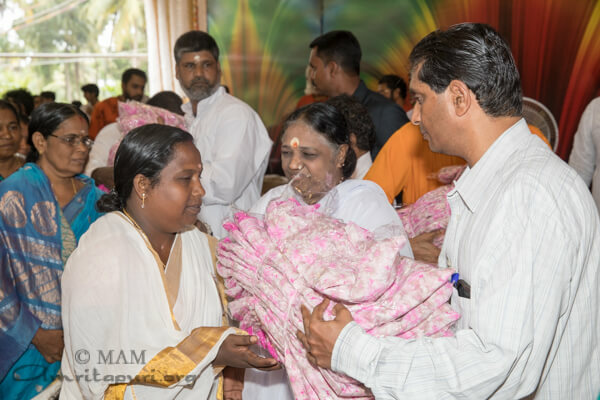 Amma extended her charitable activities in the area by distributing saris to the members of the local AmritaSree selfhelp group. 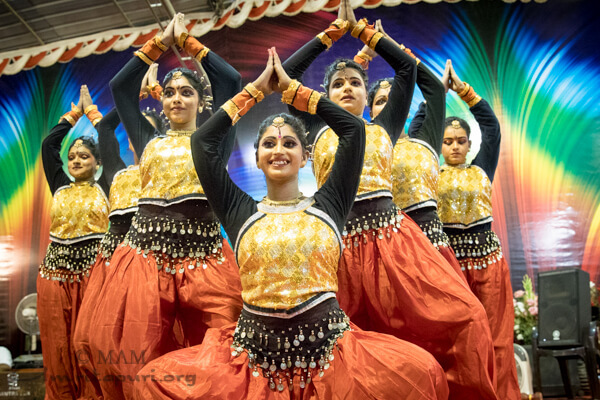 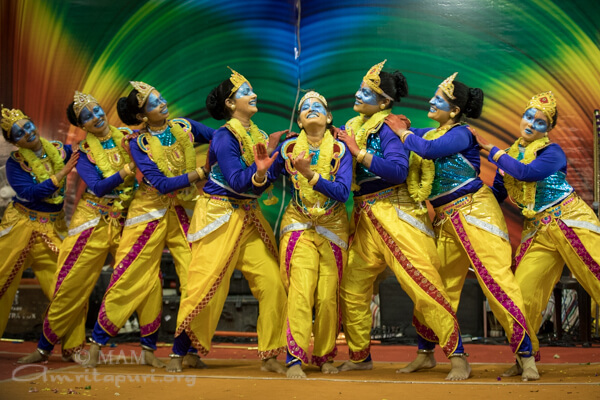 Local students from Amrita Vidyalayam and Amrita University presented different dance programs and bhajans during Darshan. 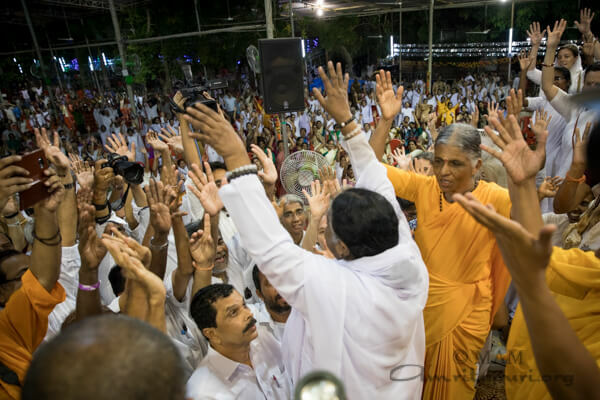 Amma concluded the two days program at 5 am on the third day and then proceeded to Trissur for the next stop on the tour.